Salamanca is the classic choice for learning Spanish in Spain. The city is where Spanish courses in Spain for foreign students really started. This is hardly surprising, as Salamanca is a beautiful university city, so students who choose to learn Spanish here can mix with Spanish students and join in the wonderful 'student life' that Salamanca is famous for. Our two schools in Salamanca run Spanish courses throughout the year. As well as a wide range of Spanish language courses, one of our schools in Salamanca also offers Spanish A-level Revision Courses for students preparing for that particular exam. Salamanca is an ancient and very beautiful city, home to one of the most prestigious universities in Europe. The stone built faculty buildings share the historic heart of Salamanca with palaces, noblemen's houses, convents and the most impressive 'Plaza Mayor' (main square) in the whole of Spain. This is an ideal location in which to study Spanish because the Spanish spoken here is pure 'Castellano', with no regional accent or dialect. Also, as Salamanca is off the normal 'tourist route', it is unspoilt by modern development. Our main school 'Salamanca Premium' is in the centre of Salamanca, just a short walk from the 'Plaza Mayor'. There are 18 air-conditioned classrooms, Internet cafe, library, student common room and a large patio. We also offer another first-rate school in Salamanca, also located in the centre of the city, with 26 air-conditioned classrooms, Internet cafe, library and roof-top sun terrace/coffee room. Fly to Madrid. Direct express coach service Madrid-Salamanca. The beautiful university town of Salamanca is the location of this excellent Spanish summer course. 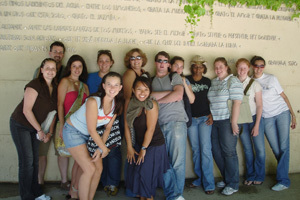 Students receive 20 Spanish lessons/wk plus host family accommodation. Students aged 16-18 years can also choose student residence accommodation. All accommodation is offered on a full board basis and is located within easy walking distance of the school which is situated in the historic centre of Salamanca. Typical activities include open-air swimming pool trip, 'treasure hunt', cycling excursion, sports, guided tour of Salamanca, parties, Flamenco lessons: 1 activity each afternoon/evening (Mon-Fri.), plus one full-day excursion each Saturday. Students are supervised, but have some free time. Airport transfers from/to Madrid are also included.